(Haha, I know my post titles have been repetitive lately, but posting on half a month’s main activities has been good for the catch-up state I’m still in right now.) Autumn is beginning to show in the leaves, creating some lovely scenery around town as I work towards getting a new dream neighbor moved in, participate in the Fishing Tourney, and knock out a few Gracie fashion checks. In early October I got to convince another one of my dream neighbors, Rod, to move in to my town! I found Jack wandering around town, like I’m sure you all did as well. I look forward to the Halloween festivities! 😀 Wonder how similar it’ll be to the GameCube version’s Halloween event. Elmer decided it was going to be his time to leave soon. Violet’s cottage entrance looks pretty with Autumn’s changing colors, I think! I read on Ryann’s blog how she thought it was pretty to see a full view of the night sky when she cut down all the trees in her town, and that gave me the idea to cut down the trees I had beside Estel’s castle. I do think it looks pretty with just stars in the background! 🙂 The castle really towered over the trees anyway, it looked kind of strange. Is this maybe a reference to Animal Crossing blogs? 😛 Or that journal you can use in the GameCube version? The day before Elmer moved out, it was actually his birthday! It was nice to get to celebrate that before he left. I decided to make a new town flag, one that would be more bright and colorful to match the fairytale town hall and its surroundings. It’s based off the moon in Van Gogh’s “Starry Night.” I thought the one I had before looked better when my town hall was dark blue, and that it didn’t match the new fairytale town hall well. I hadn’t ever been to Sandy before, so it was nice to get the chance to look around, and we played some fun games too. She has lilies and violets around her fountain as well, hehe, looks great! Then we went to Kiki’s town Meadow, which I’d only visited in a dream before. Meadow was gorgeous to see in person, soo many hybrids! 😮 The entrance here made me think of Valentine’s Day. I didn’t realize this clock did anything at the turn of the hour until Teru told me, but it does! It looks like a little toy soldier or Nutcracker man. Yay, second fashion check! 😀 I passed and she gave me a sweets chair. After returning a lost item, Robin gave me her picture all of a sudden, the first picture I got that wasn’t in a goodbye letter. 😮 I was kind of hoping that honor would go to Melba, but I guess I’ve had Robin longer. And when I went to go see what her picture looks like, she came over unexpectedly! Geez, our friendship must be high! o_o It makes me feel a little bad since I’ve actually been wanting her to move out for a while, so I can build the café and other things where her house is. October 12th was the first Fishing Tourney! My neighbors’ performance was pretty poor, they couldn’t do any better than a 3-inch bitterling. 😯 I demolished the competition with my shark. 2) if the fish is considered large for its species. A few days later, for Explorer’s Day, Isabelle gave a sailboat model and there was a signboard as usual. Wow, can’t believe Gracie came back so soon! In AC:WW I would often change my paths or even completely re-do my town with the changing seasons, but I don’t think I have time to do that for AC:NL right now, and I’ve invested too much time in getting it how it looks in its current state. So this spot in town is my little dedication to the current season! ^_^ But Robin said she’s moving out soon, so I guess I can build the café around here soon. 😯 *gulp* The thought still makes me nervous after all this time, since it’s permanent. 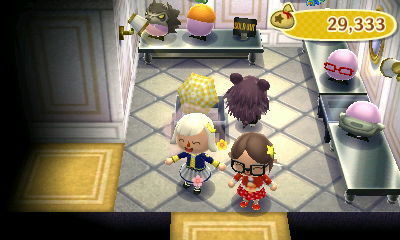 Posted on October 27, 2013 by Amy •	This entry was posted in AC:NL, AC:NL WiFi, Citalune and tagged Animal Crossing. Bookmark the permalink. Aww, i also got one of my dream villagers, monty. I also have peewee up for sale if your intrested. and thanks! I had a nice wifi party with you guys! Maybe we could do another wifi party sometime. Awesome, congratulations! 🙂 I had Peewee in my AC:WW town, and though I have a bias against the ape characters, I actually grew fond of him. But he isn’t one of my dream neighbors in New Leaf, I’m hoping for Bruce as my resident cranky. In wild world, my favorite cranky was Octavian, not on how he looked, but he kept saying how awesome I was so i kept him. Goldie was real nice too, she was gentle and she moved into the PERFECT place. did you ever get her? Aah, Amy! I have to say that I love your connection with art. When I read your Wild World “diary” you wrote a lot about the art exihibit and whichoriginal you see in “real life”. And I totally love your new town flag. I saw a few of Van Goghs originals in Paris in the Mousée d’orsay, wonderful place, and of course a lot in Louvre. So,I’m happy you choose him and your town flag is awesome! It looks a bit like pastel and the colours are bright and pretty. Oh,and I hope you have more time to play in the near future. In germany we have autumn holidays for 2 weeks so I spend every little minute on my little town. 😀 I guess it will be hard to to have limited time so I feel with you. Sure, I’ll try to explain! The reset trick I’ve mentioned for controlling where villager houses go involves creating a new character on a day you’re expecting a new neighbor to move in. It has to be a new character, and you can’t load your mayor character beforehand that day, or else it won’t work. When your new character exits the train station, you can run around looking for a house plot. If the house plot is in a good location, or if there’s no house plot at all, make sure to save the game by building a house for the new character with Nook and then talking to Isabelle. If the house plot is in a bad place, you can reset without saving and make a new character again, repeating the process until you’re satisfied. You might wonder how to know whether or not to expect a new house plot.. well, after WiFing or StreetPassing, it’s a good idea to load with a new character the next day just in case. And when you’re down to 8 neighbors, there will be a chance of a house plot appearing each day. The percent chance of the house plot appearing gets greater each day, until it’s at the point where after a week or so of only having 8 neighbors, there should be a 100% chance of a house plot appearing. A video description – I watched this recently even though I already know how to use the trick, and it seemed helpful and well-done. I’m glad you’re enjoying your holiday! 😀 I had a Fall break recently as well, but it wasn’t very long. I might get some more days off for Thanksgiving coming up soon, though. 🙂 I still find time to play AC:NL, but it’s hard to have time for big projects like re-landscaping and making new paths. 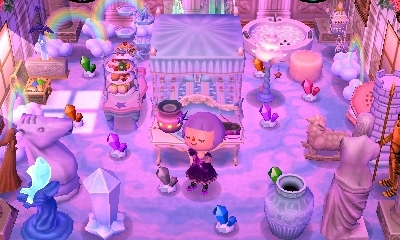 This is kind of a late tip, but I got my Emporium on the day I got Gracie for the first time in my town, since there seem to be set days she’ll appear. I Time Traveled to the next day and back and I was surprised to see Gracie again with a different fashion check request! So I guess that’s something people who really wanted the Emporium could do? Yeah, it’s weird, I remember them being more competitive in the Bug-Offs. Yeah, I noticed how frustrating it is to get the exact location of a house with Joey. I kept resetting, and he had like 5 places he would go, and then it would just repeat until I picked one…it’s so frustrating! Ahh, that veggie basket looks so nice! Is it orderable out of the catalog by any chance? Wait, so can you explain how the fishing tourny groups work? Like, do the groups available to get alternate each tounry? Ouu, I like the idea of an alternating section of the town depending on season! I agree that the whole town would be too much, because Citalune wouldn’t really be a starry, dreamy town anymore, but a seasonal town. The reason why there are only orange and yellow lilies in that town hall pic is because it's the end of a sort of rainbow "fade" formed by the flowers. ie. The first row is blue violets, then purple violets, then white violets (which look light purple to me), then pink lilies, red lilies, orange lilies, yellow lilies, and then a mix of orange and yellow lilies by the town hall. So the row of pink lilies is a little further down in the fade. But maybe when I grow some more pink lilies I'll add them to the orange and yellow lilies by the town hall, that might look nice 🙂 Thanks for the suggestion! Okay, whatever works for you! I should be around all night, (aside from stepping away from my game to grab the door for trick-or-treaters that is :P), so if 5pm doesn’t work for you, just give me a shout on here or on my email or something; lang.ryann@gmail.com . Ooh the view of Estel’s house is much more special without the trees, I think! Especially since the night sky has a significance to your town. And I thought that flag looked Van Gogh-esque! That’s such a cool and well-executed idea, and it really does enhance the area (as if it even needed enhancing :P). It really brightened up the station, too. I figured Julian was a dream neighbor of yours, so I wouldn’t want to ask if he’s a permanent neighbor! It also sounded like you weren’t happy about him moving 😦 But he’s at least still in your other town! And no worries, I actually have him in my other town (used the reset trick), so I can transfer him to Citalune when the opportunity arises. Oh okay, so you have to dive to catch a scallop… I thought a scallop was something you found on the beach. xP Urgh, I don’t like diving much, it frustrates me. I loved this post (For absolutely no reason!)! Congrats on getting Rod! I’d like to do one of the villager-trade things, but on the website you were on I saw something about Tumblr contact numbers etc, and as I have no account or wish for one, I guess I’m still stuck in the same spot. But the two upsides of having none of your dream neighbours is that 1) There’s no worry about them moving out and 2) You get to see more fresh faces that way. How do you do that resetting thing to get a neighbour’s house in the perfect position? Is it just normal, e.g. you turn on the game, Isabelle announces a new villager, you see where his house is, then, if you don’t like it, you just turn it off? I’d’ve thought Nintendo woulda been able to stop it, but they weren’t incredibly careful with bugs and stuff, so…yeah. I also can’t wait for Hallowe’en on ACNL!!! My friend is coming over (We were gonna WiFi anyway) and my brother’s going out trick-or-treating, so we’re probably going to play for hours! ‘Course, I didn’t bother getting much of an outfit until I saw the racing driver pants and shirt in the Ables’ a few days ago. Now I regret not being ready…I guess that’s why they have the masks for free, so that it’s not a total disaster if you have no costume. I hope it’s NOT like GC’s, I’ve seen enough pictures and videos to tell me that the animals are VICIOUS. I love Estel’s castle! I keep forgetting to go to the island, so I have no spare money for my loan. This also translates as I’m too lazy to pay off money to some fat raccoon in a jogging suit. Heh…that was kind of unnecessary, but kind of true, too. I think Sandy’s patterns are adorable! So’s Kiki’s! They really do look AC-Valentine’s Day inspired to me-the hearts, and the brown bricks that look like Brewster’s chocolate! Ugh, Sea Cove got TIY a while ago, but Gracie is turning up her heavily powdered nose at it. Never mind. N'aww, poor Biskit. Actually, my friend who's coming over loves Biskit. Small world, huh? Aw, I’m sorry the Tumblr villager trading won’t work out… It’s a good resource, but you have to be reallyyy quick in order to reserve a villager posted there, anyway. The same sort of villager trading also goes on at AC sites/forums like this, but I’ve noticed that auctions/trading are popular there, so you have to potentially have a lot of bells (millions, even) to buy a villager. (Either that, or popular villagers to trade with.) I like that AC:NL Adopt is run by people just giving away villagers to whose who want them for free, out of the kindness of their hearts. Thanks, glad you like it! 🙂 I haven’t been going to the island much either, I’ve been making decent bells lately selling perfect fruit in another town. I heard that Gracie shows up only after you’ve spent enough money at T.I.Y., so maybe shopping more could help? Haha, that’s exciting 😮 Did you get to celebrate her birthday on her move in-date, or was she in boxes? I don’t think I’d be able to monitor AC:NL Adopt or anything for villagers, I’ll just get them the normal way, even if I’m still hanging around waiting for the ideal villager. Plus, I’d love to have Bob, and he’s so popular, someone could have him up for a second and someone else would grab him! Yup, it’s very easy for me to play, just get up, check T.I.Y., maybe go to the island, or do something else. Lately, though, I’ve been doing very little, instead playing Pokémon X and today I lost my 3DS …:'( Hope it turns up soon. I just realised that you’d already explained it and felt kind of dumb. But you explained it really well! Sometimes all these game-loopholes can give you a headache. I don’t think I could go through all of that, unless the house ended up smack-bang in the middle of my path, but when I see that, it’d kinda be too late. Zucker moved into my town recently (I hate him…) and is literally right next to my road. But on Hallowe’en I got my revenge…in case you haven’t got to it yet, I won’t say what I did, because it gives a tiny bit away, but it was enjoyable. And so are the ‘treats’, as you call them. I guess you’ve gone through Hallowe’en in a friend’s town, but a) if you haven’t, I won’t spoil it and b) if you have, I don’t need to explain anything! No, I had no idea she’d moved in when I went to greet her until I passed the bulletin board and checked it. Do you use a guide for your fashion check, or do you kind of wing it? 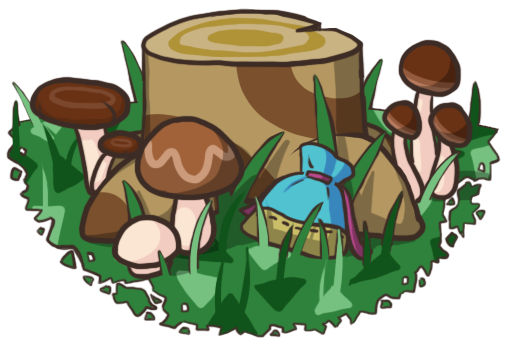 Another thing to consider is that the reset trick can also be used to reset for certain villagers, not just house locations. But that can also be a bother, because they won’t necessarily move into a great place. 😛 But ah well, the way you’ll end up getting your dream neighbors is the way the game intended it after all, random chance. It should be fun to see so many different neighbors pass through your town. Zucker is actually really popular, did you know that? You could probably get a good deal selling/trading him online. xP I kept hearing about him on the Bell Tree Forums so I finally looked him up, and I admit I don’t really see why he has such widespread appeal 😛 I guess ’cause he’s a new octopus. Yeah, I did end up experiencing Halloween a bit on the correct date in a friend’s town, and it was a really well-done holiday! Loved all the variety of options and things to do: scaring indoor neighbors, trick-or-treating outdoor neighbors (and playing mini-games with them), looking for Jack, collecting both the spooky and creepy series and the pumpkin masks, etc. And I learned a lot about how everything works for when I catch up to Halloween in my own town.